Promoting skin bleaching among Black women is just low. 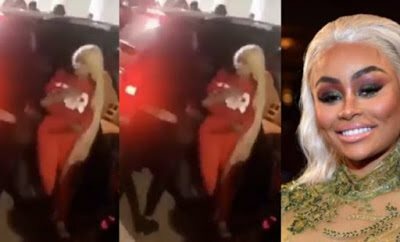 AFRICANGLOBE – Blac Chyna is bringing her self-haterd to Lagos, Nigeria. Read to promote her foolish skin bleaching cream, which is bizarrely titled Whitenicious, the 30-year-old mother of two was caught on camera getting into a fight outside of car in Lagos, Nigeria. Footage shows the reality star getting out of her car to fight someone but was pushed back in. It’s suspected that it’s one of her team members, but that’s currently unclear. Chyna is in Nigeria to promote a line of skin bleaching cream, which she has been heavily criticized over. Whitenicious x Blac Chyna Collection costs $250. Skin bleaching is big business in Nigeria. Sadly, 77% of women in Nigeria use skin bleaching creams. According to the World Health Organization, chemicals in skin bleaching creams can cause liver damage, reduced resistance to infections, anxiety, depression and other dangerous side effects. The launch party in Lagos, the country’s biggest city. Previous articleA Year After: Are Some Zimbabweans Regretting The Removal Of Mugabe?